System administrator can define [Billing Rate Type] as [Project Roles Billing Rate] to setup role wise billing rate for project. 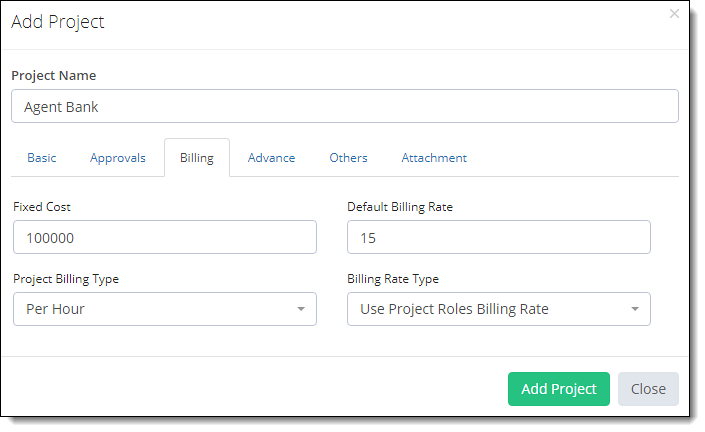 There are three steps for setting up role wise billing rate of project. Define [Project Roles Billing Rate] in [Billing Rate Type] when adding new project in TimeLive. On click on [Add] button, TimeLive will open a [Project Role] definition page where use can setup number of resources required for each role and billing rate of every role. Just select your required [Roles] for which you want to define billing rate including its number of resources requirements. On clicking on [Update] button, timelive will open employee role mapping page where system administrator can define employee for each of the role requirement defined in [Number of Resources] for every role. Just map your required employee for each of the role and check on [Selected] checkbox. After completing this role employee mapping, click on [Update] to update these changes. Using role billing rate history, administrator can add new billing record with its applicable date and he can also modify any of existing record also by clicking on [Edit] link. Administrator can delete any of these billing history record by clicking on [Delete] link. In case if Administrator wants to modify billing rate of exiting time entry records, he can just add / edit billing rate record in history with selection of checkbox [Update all records within time range]. It will update existing time entry records also with this new updated billing rate in specified date range. To launch billing rate history page, just click on [History] link of any role selected for current project.